I set out to continue to be intentional about using projects in my stash this year, so I tackled my Lori Holt's Bee Happy! applique blocks this month as my June OMG. I wanted to make some obvious progress in getting more of these blocks done. I think I did good! I will continue to work on this one in-between other projects with the motivation to have it done and quilted by the end of my summer break. 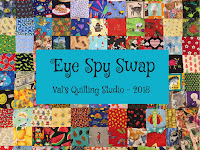 I also crossed an eye-spy quilt off my list this month and got another quilt's binding done. I appreciate Patty's OMG as it rejuvenated this project which provides the perfect summer sewing for me . What a fun quilt! I love all those blocks. Thanks for linking up with Elm Street Quilts One Monthly Goal and congrats on your finish! Great quilt, I like those with a lot of different blocks and sizes put together. I can tell you are having fun with the Bee Happy blocks--so cute! I agree--the One Monthly Goal is so helpful to keep me on track! That is great progress. What a fun summertime project. You are on a roll! :) It looks awesome! You made LOTS of progress. I like the colors in the blocks. Congrats on all the progress. OMG is such a helpful motivator, it helps one find a focus for the month too. Hope your July is even more productive. what great and happy blocks. Also your header always makes me smile. This is coming out so cute. What a fun quilt to be working on (bee working on?) during the summer! I love the creamy colors. When I go to your blog, I just have to smile. I just love your self portrait!